Submitted by Norm Roulet on Tue, 08/10/2010 - 15:13. Beautifully timed, just days after the EPA Hearing about MCCO's permit to burn coal in excessively polluted Northeast Ohio for five more years, and in the middle of a Smog-Wave and air pollution crisis - as citizens awaken to the fact their air pollution monitoring for Northeast Ohio has been broken by NOACA (Northeast Ohio Areawide Coordinating Agency - which is responsible for managing air quality here... for as long as there has been a NOACA) - the NOACA Governing Board is meeting on their unluckiest Friday the 13th ever. The Cuyahoga Democratic Party has asked for the resignation of two of their most powerful and ineffective leaders - Jimmy DiMora is on the NOACA Governing Board and has not personally attended one meeting this year - neither has Tim Hagan. Neither has Cleveland Mayor Frank Jackson - his planning Director Bob Brown only attended three... same with Commissioner Jones. RTA Boss Dixon - none. Port representative Raskind - none. ODOT representative - 2 out of 6 meetings. NOBODY FROM THE EPA. Citizens must now recognize the breadth of their influence and failure, causing failure of the region and state though such vehicles as the governing board of NOACA. Obviously, the Governing Board must ask for the resignation of any members so embroiled in failure, and should purge itself of internal failures beyond... like public officials too self-occupied to attend the monthly meetings. 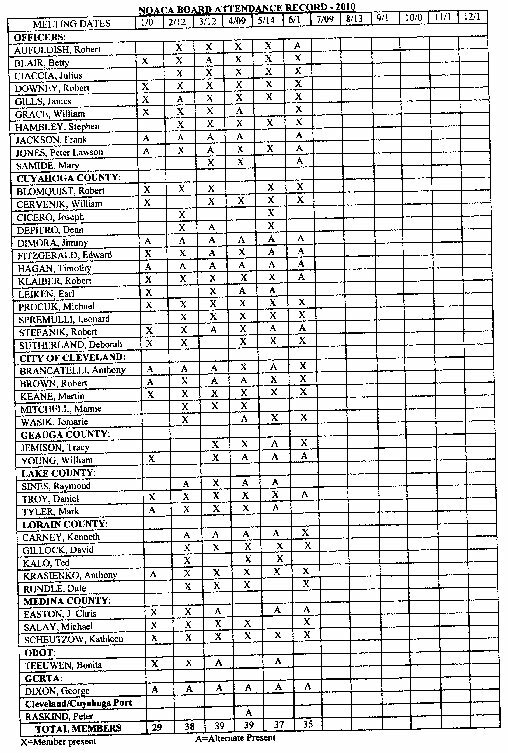 I believe any public official who has missed more than two out of the six NOACA governance meetings without a medical excuse, as indicated on the attendance sheet above, should be removed from this board. Further, the Executive Director of NOACA should not receive a contract extension, as is indicated on the agenda, but rather should resign and be replaced by someone who may manage this life-sustaining function of government for the better interest of the public. I intend to attend this meeting and ask for these reorganizations of NOACA, and much more. Please join me, or express your desires to see change at NOACA here or in your own ways - they need to know how furious citizens are for being poisoned unnecessarily through political corruption. Below is the agenda for Friday the 13th NOACA meeting, with the full meeting files attached as PDF here. The NOACA Governing Board will meet at NOACA Offices on August 13, 2010 at 10:00 a.m.
sdinunzio [at] mpo [dot] noaca [dot] org?subject=Board%20Meeting if you have any questions. The NOACA Governing Board meetings are usually held on the second Friday of each month. Board agendas are posted one week prior to the meeting. sdinunzio [at] mpo [dot] noaca [dot] org?subject=Board%20Agenda for additional information. Next Meeting Date: Friday, August 13, 2010 at 10:00 a.m.
You can view the meeting materials available in PDF. 1299 Superior Avenue in Cleveland, Ohio. Submitted by Norm Roulet on Fri, 08/13/2010 - 03:08. Submitted by Norm Roulet on August 13, 2010 - 3:07am. in this region and so the state of Ohio and EPA region 5. Spamhaus Over and Above the Law? Submitted by howleplalac on Tue, 10/02/2012 - 14:40. - Blackmails ISPs to comply to their rediculous "demands"
(hinder communications with specific other computer systems). as a UK limited, appearantly with a branch office in switzerland. for large scale commercial use for profit.